Taipei, Jan. 16 (CNA) Democratic Progressive Party (DPP) presidential candidate Ms Tsai Ing-wen on Saturday declared victory in Taiwan’s presidential election, before the final ballot count was announced. Ms Tsai, 59, leads the Democratic Progressive Party (DPP) that wants independence from China. As of 8:50 p.m., Tsai had 6.74 million votes or 56.2 percent against 3.71 million or 30.9 percent for her main rival, Eric Chu of the ruling Kuomintang, according to local media. 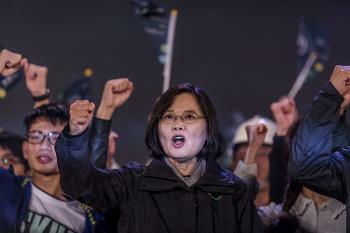 In her victory speech, she vowed to preserve the status quo in relations with China, adding Beijing must respect Taiwan’s democracy and both sides must ensure there are no provocations. China sees the island as a breakaway province – which it has threatened to take back by force if necessary. In her speech, Ms Tsai hailed a “new era” in Taiwan and pledged to co-operate with other political parties on major issues. The will of the Taiwanese people would be the basis for relations with China, Ms Tsai said. “I also want to emphasise that both sides of the Taiwanese Strait have a responsibility to find mutually acceptable means of interaction that are based on dignity and reciprocity. “We must ensure that no provocations or accidents take place,” Ms Tsai said, warning that “any forms of suppression will harm the stability of cross-strait relations”. She thanked the US and Japan for their support and vowed Taiwan would contribute to peace and stability in the region.